This was one of the hors d’oeuvres at a party we hosted before an outdoor concert at the Minnesota Zoo. Average White Band rocked the house. And so did this Roasted Herbed Tomato Tart. Something magical happens when tomatoes are tossed in olive oil and then slow-roasted in an oven. 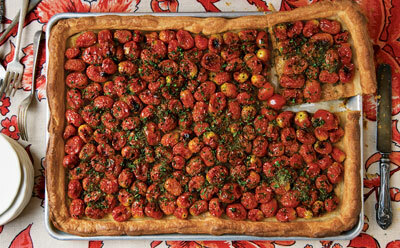 The sweetness of the tomatoes is enhanced and the flaky tart creates a great texture. Heat oven to 375°. Fit pastry sheets side by side into a parchment paper–lined 13″ x 17 3⁄4″ rimmed baking pan, pressing pastry against bottom and sides. Trim inner edges of pastry sheets so that they form a seam in center; trim pastry hanging over sides of pan. Prick bottom of pastry with a fork. Line bottom and sides of pastry with parchment paper and fill with dried beans. Bake until edges of tart are golden, 25 minutes. Remove beans and parchment paper, sprinkle Parmesan over tart shell and bake until cheese is melted and tart shell is golden all over, 15–20 minutes. Transfer to a rack; let cool. Heat oven to broil and arrange a rack 4 inches from heating element. In a large bowl, mix together oil and anchovies; add tomatoes and season with salt and pepper. Toss to coat. Transfer tomato mixture to a rimmed baking sheet and broil, shaking pan once or twice, until tomatoes blister, 12–14 minutes. Let cool slightly. Use a slotted spoon to transfer the tomato mixture to the prepared tart shell; distribute tomatoes evenly. Increase oven heat to 425°. In a medium bowl, combine the parsley, chives, oregano, and nutmeg; sprinkle herb mixture evenly over the tomatoes. Return tart to oven and bake until hot, about 15 minutes. Let tart cool slightly before serving.